METAL CHURCH - GENERATION NOTHING VINYL (2LP BLACK) | Online Shop | Wizard LTD. Album: "GENERATION NOTHING VINYL (2LP BLACK)"
"Generation Nothing", the tenth studio album from the reunited METAL CHURCH — Ronny Munroe on vocals, Kurdt Vanderhoof and Rick Van Zandt on guitars, Steve Unger on bass, and Jeff Plate on drums — sold around 600 copies in the United States in its first week of release. The CD was issued on October 22 via Kurdt&apos;s label Body Of Work Recordings in conjunction with Rat Pak Records. 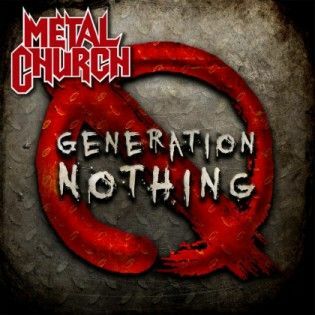 According to Vanderhoof, "Generation Nothing" — which was recorded at Kurdt&apos;s English Channel studio in Washingtion — marks a "return to [METAL CHURCH&apos;s] classic metal sound. It has elements of the first album and &apos;The Dark&apos;, but still embraces the new sound of the band without chasing the past." Munroe said in a recent interview with Metal Assault that the new METAL CHURCH effort would contain material that is "very reminiscent of the old days with some stuff that&apos;s very &apos;now.&apos;" He added: "There&apos;s a bit of… I&apos;m not going to say &apos;prog&apos; because it&apos;s not, but there&apos;s a couple of elements in there that are a little bit progressive. For the most part, out of this batch of songs, they really sound more reminiscent of the early days than anything we&apos;ve done before with this lineup. This excites me very much, and I think the fans are really going to dig it."